It has been about five years since the so-called subprime mortgage crisis rattled Wall Street (and America), and led to scores of layoffs and bank failures. In the years that followed, thousands of mortgage companies that were turning major profits disappeared seemingly overnight. To celebrate, or rather mark that anniversary, the Center for Public Integrity is publishing a three-part series on what has happened since. Or more accurately, what the major players are up to now. It reads more like an exposé than anything else, singling out the bad players that ostensibly caused the crisis, who are now back in the game working for new companies. They focus on the top 25 subprime lenders of days past, which collectively dished out nearly $1 trillion in high-risk mortgage loans between 2005 and 2007. These companies, which include big names like Countrywide, IndyMac and Ameriquest, accounted for nearly three-quarters of high-priced loans during the subprime peak. And now their old executives run new businesses that will shape the mortgage market (and housing market) of the future. This is rather scary, given the fact that they didn’t do a great job in the last decade, and probably won’t do too much better in coming years when competition heats up and desperation kicks in. In fact, we’re already seeing some bad signs of loose lending resurfacing, what with CashCall offering 125% second mortgages and Suze Orman telling viewers that it’s okay to put less down on a home. As time goes on, I’m sure more and more high-risk loan products will emerge, used to combat higher mortgage rates and home prices that will soon be out of reach to more borrowers. 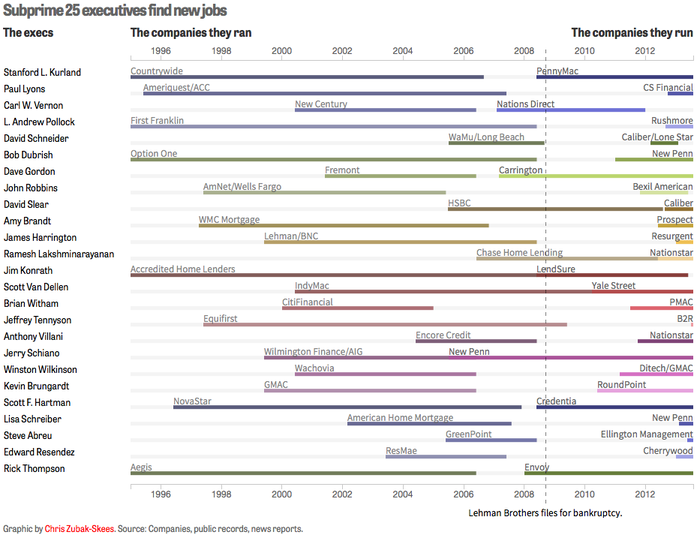 The top of the list (see larger version) is of course a former Countrywide Executive, Stanford L. Kurland to be precise. He served as Chief Operating Officer during the golden years of the housing boom and later as President. After the dust settled, he founded PennyMac, which first invested in distressed mortgages and now originates new mortgages. 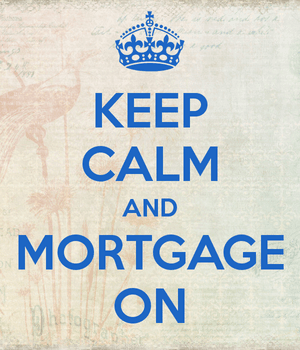 Many envision PennyMac being another major residential mortgage lender in the not-too-distant future. In fact, PennyMac already made the top 10 lender list in the fourth quarter of 2012 thanks to its correspondent lending business. Next up is Paul Lyons, a former director at Ameriquest, probably the definition of subprime, who now works as COO for CS Financial, which is starting to dabble in some “Alt Income” lending. He now runs Yale Street Mortgage, which provides bridge loans and hard money to investors looking to flip properties, among other things. The list goes on and on, and it’s actually quite an interesting read if you’ve got a few minutes. If anything, it appears to be business as usual, and it won’t be long before this supposed real estate boom we’re in goes sour again. In the mortgage industry, new rules are created all the time, but with each new rule that surfaces, a smarter mortgage executive comes up with a way to circumvent it, and fast. That will never, ever change.